We’d love your help. 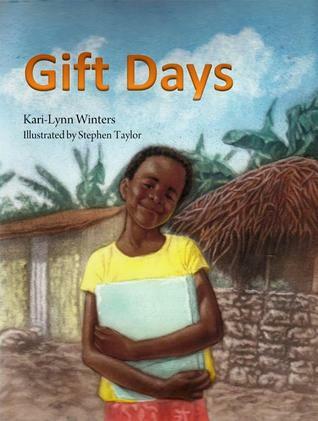 Let us know what’s wrong with this preview of Gift Days by Kari-Lynn Winters. To ask other readers questions about Gift Days, please sign up. This was a really good book that is nonfiction. My students and I had great discussions about the topic that was covered in this book. At first they said they would love to not do school, but then after reading about all her chores they decided they rather get an education. “Gift Days” is about overcoming obstacles. In this tale, a young girl, in spite of her determination to learn to read on her own, is only able to realize her dream through a special gift from a loved one. We learn that gifts of kindness, however small, can make a real difference in the lives of others. Many children throughout the world, especially girls, due to circumstances beyond their control, do not have a right to an education. Kari-Lynn reminds us through her inspiring story that education “Gift Days” is about overcoming obstacles. In this tale, a young girl, in spite of her determination to learn to read on her own, is only able to realize her dream through a special gift from a loved one. We learn that gifts of kindness, however small, can make a real difference in the lives of others. Many children throughout the world, especially girls, due to circumstances beyond their control, do not have a right to an education. Kari-Lynn reminds us through her inspiring story that education is indeed a gift to be treasured. Stephen Taylor’s charming mixed media illustrations, many with monochromatic backgrounds are a good match for the story. One of my favourites is the lovely vignette-like illustration of Nassali, who has fallen asleep embracing her brother’s textbook. Wonderful, moving story about a Ugandan girl who cannot realize her dream of an education because she must care for her younger siblings until her brother gives her "gift days" that give her time to learn. An afterword explains Article 28 of UN Convention on the Rights of the Child and HIV/AIDS situation in Uganda. Nassali wants to go to school very badly but she needs to take care of her younger sister's. One day a week her older brother helps out with her work so she is able to study. This is a delightful story of family life in Africa. Checked this out for Girl Scouts "World Thinking Day"
Made me realize how lucky we are to obtain an education and what a difference it can make in someone's life to have knowledge as well as the confidence that comes from that. It truly is a gift to be educated. Kari-Lynn Winters is an award-winning picture book author, playwright, and scholar who enjoys being in the classroom in any of these capacities. She holds a position at Brock University as an associate professor of drama-in-education and literacy. Her graduate work, which was completed at the University of British Columbia, focused on combining the arts with reading and writing. When Kari-Lynn beg Kari-Lynn Winters is an award-winning picture book author, playwright, and scholar who enjoys being in the classroom in any of these capacities. She holds a position at Brock University as an associate professor of drama-in-education and literacy. Her graduate work, which was completed at the University of British Columbia, focused on combining the arts with reading and writing. When Kari-Lynn began to write children’s picture book manuscripts and submit them to publishers about nine years ago, people often shook their heads, advising her to write novels instead. “It is so difficult to get picture books published in these times,” they said. But Kari-Lynn persisted, continuing to collect, read, research, and write picture books. Her persistence paid off. Today, twenty books (picturebooks, poetry, non-fiction) that Kari-Lynn wrote have been accepted for publication. In addition, she has had academic chapters and articles about multimodality and student literacy published by Heinemann and in The Reading Teacher.